Offering you a complete choice of products which include courier bags with pod jacket, security bags with pod jacket and glossy courier bags with pod jacket. Courier Bags With POD Jacket are useful for E Commerce companies for safe and secure movement of their goods ordered by customers. Three layered packaging bag will keep product hidden from view. Tamper proof feature of these bags make them very trustworthy for online sellers to deliver exact product what they have sent. Owing to our state-of-art manufacturing unit and the usage of leading-edge techniques, we are able to present a comprehensive range of Security Bags With POD Jacket. These kinds of bags with POD are made from high-quality LDPE plastic. POD Bags contains Transparent Plastic Jacket widely known as POD Jacket on the back side of the bag for the insertion of Shipping Address, Waybill, Invoices, Note conveying thanks etc. With this concise pocket, important documents or notes remain protected. It saves a lot of time and transcends a strong corporate image. This clear overlapping jacket helps in protecting documents from water and other impairments in transit and ensures glue and adhesive free insertion of shipping labels. Tamper-proof bags are also commonly called courier bags. They are manufactured from customized co-extruded polyethylene film, with a flap which has a hot melt adhesive strip for easy & permanent closure. Once the bag has been opened for any reason, it cannot be put back again to normalcy ensuring the customer that the product is factory sealed. These kinds of bags with POD are made from high-quality LDPE plastic. 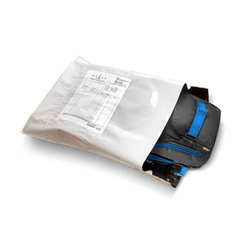 GLOSSY COURIER BAGS WITH POD JACKET are also commonly called courier bags. Looking for “Courier Bags With POD Jacket”?